CALGARY-When all is said and done, there’s absolutely nothing remotely shocking nor revelatory about The Long Dumb Road. It plays out its indie darling buddy-comedy beats exactly as one would expect from beginning to end. And yet, the genuine affability and downright likability of its two main leads, and incredibly charming dialogue in the script, more than make up for its sometimes blasé narrative shortcomings overall. Nat (Tony Revolori) is finally ready to start the next chapter of his life. Having lived safely ensconced in the upper middle-class comfort of his parent’s wealth for years has had its equal share of ups and downs. Remaining in his parent’s nest has made Nat a little bit sheltered and a whole lot inexperienced with life in general. He finally decides to take his parent’s sometimes-reliable purple minivan along with what few cherished belongings he owns from his home in Texas, and plans to drive all the way to LA for art school. 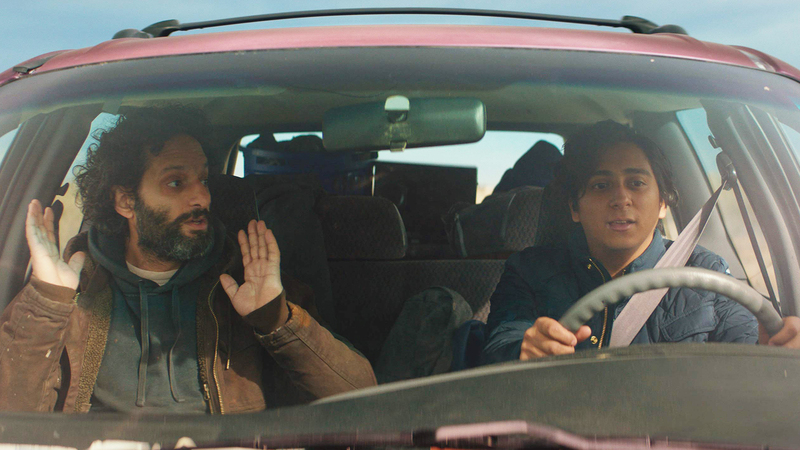 At the first gas station on his road trip, his van breaks down almost immediately, so he enlists the help of ex-mechanic Richard (Jason Mantzoukas) who’s mere moments fresh off from being just recently fired. As is only natural, the two strike up a friendship that will take them down a journey of self-discovery and acceptance. It’s a journey that neither of them will have been able to have previously anticipated or predicted, even if the audience certainly will. Revolori and Mantzoukas truly are a perfect odd couple pairing, by virtue of constantly trading back and forth both sweet soliloquies and salty barbs in equal measure. Revolori plays the awkwardly shy Nat with the most delicate of ease, while Mantzoukas was born to play the foul-mouthed alcoholic has-been Richard. Much of what works about the film is the latter talent’s innate ability to say the most obnoxious or gross-out thing possible, all the while coming off as entirely genuine and sincere throughout. The film is co-written and directed by Hannah Fidell, who handily flexes both her written and directorial muscles, as she has before in her limited but nonetheless impressive career. Her previous work includes the much-underappreciated romantic drama 6 Years, which also starred Taissa Farmiga, about a long-term relationship from both the male and female perspective. It’s both touching in its tenderness and blistering in its brutality. The Long Dumb Road is also equal parts tender and blistering, but you’re left wanting more in the end. You’re ultimately left wanting to spend more time with these characters, because they’re just so well realized overall. A sequel to the film is unlikely, but there is a silver lining, however. Jason Mantzoukas who has oftentimes been the best part in several popular comedies over the last few years has been working hard on a riotously funny podcast. If you’re a fan of his style of comedy, which is in full affect here, then taking a listen to “How Did This Get Made?” will most definitely be worth investing your time.